George Vancouver was born in King’s Lynn on 22nd June 1757, the son of the Receiver of Customs for what was then the third-largest port in England. He is best known for his exploration and mapping of the west coast of America from San Francisco to Alaska between 1791 and 1795, during which voyage he also mapped the southwest coast of Australia and parts of Tahiti and Hawaii, and named several hundred places after people and places he knew in England. He died in 1798. The family home of George Vancouver, formerly in the centre of King’s Lynn, is no longer there; for our heritage-aware culture the family home, the prime object that anchors person to place and links us to an icon of the past is lost. The absence of the house here allows us to ask what we want to know, how we create or lose memory without an object, and to examine what we use the past for. It leaves a space at the centre of the story of George Vancouver, onto which there is a potential for projecting and reflecting our own understanding of his life and work. Though there is no clearly-defined place in which we can say “George Vancouver was born here” or “George Vancouver lived here”, few people of his time left so many markers of where they went, nor such long-lasting ones. We are aware that place-names come from somewhere, that names other than those that mean “new town” or “crossing place” often commemorate people, and that these links become embedded in the histories of places. The application of names from one culture to the sites of another raises for us spectres of colonialism and cultural imperialism; cultural restitution applied to place-names re-enfranchises suppressed cultures, but may do so at the cost of suppressing acquired histories. Regime changes often bring changes in place-names, which become part of the archaeology of place as much as artefacts and the traces of buildings. The fact that Vancouver’s charts and names are still in use may have little bearing on our own lives; but the need to know, the meticulous and purposeful acquisition of data, the safe but productive management of staff, would sound familiar to most of us. The late eighteenth century was not so different from our own time: nations scrambling to control commodity markets, the drive to control and exploit knowledge, steep learning curves in dealings with other peoples, cultures and civilisations encountering each other with varying degrees of wariness and fascination are all as much part of our time as they were then. The North-west coast of America provided a chance to exploit a raw material and trade it at great profit, using local skills and moving manual workers from one zone to another as demand required, linking Western Europe, Russia, China and America in an enterprise that created sudden and vast fortunes. Territorial control and access to trading areas demanded knowledge of local geography, which were acquired for British traders primarily by Cook and Vancouver; as always, a little knowledge of local language smoothed transactions. Vancouver was given instructions from the Admiralty that were strictly governed by the requirement for exploitable knowledge, the need for accurate and dependable charts of harbours, safe anchorages and routes. Beyond this, the observation of the continental shore, he was restrained from exploring. There were three main reasons for Vancouver’s voyage (1791-5): the settling of the question of the North-West passage, the longed-for direct route across the North American continent; the accurate mapping between latitudes 30° and Cook Inlet, roughly from present-day San Francisco to Anchorage in Alaska; and the acceptable settlement of territorial and trading access rights to the area of what is now called Vancouver Island. This last had been occasioned by the dismantling by Spanish authorities (Spanish claims to the entire western coastline were based on a Papal Bull of 1493) of a building or buildings established by an English trader, Captain John Meares, in 1789. Thus the concept of exchange lies at the heart of the Voyage, exchange of objects, of names, of people, food and information. But the notion of equal exchange breaks down: Vancouver names (and sees) different places from those defined and named by local people; the muskets so desired by the Indians are not forthcoming, though arrows, spears, knives and clubs are freely given; and the expected one-to-one linguistic correspondence does not work out. However, in the exchange of sea-otter skins for chisels each side comes away with a curious kind of bargain; the Haida people’s first name for white men was "yaatz-haada" or "iron people", reflecting the most important and exploitable aspect of the strangers. Family connections may have smoothed the path of Vancouver’s naval career, but he was a sailor of great skill, diligence and care. From the age of 15 till his death at the age of 41, Vancouver spent most of his life at sea, retiring to spend his last 3 years in England because of his failing health. He sailed on Cook’s second and third voyages between 1772 and 1779, and spent many years afterwards on duty in the West Indies. In a sense then Vancouver’s home was the sea and the ships he was stationed on. With this in mind we can perceive, looking at the names he gives to places, that his first concern is not for the land, but the sea and the safety of the ships operating at its boundary with the land. While bestowing several hundred names along thousands of miles of coastline, Vancouver was rarely given to enthusiastic appreciation of what he saw along the coast of America. In his four volume Voyage of Discovery published in the year he died, he occasionally describes indigenous houses; often they are dismissed as crude, or have been abandoned or dismantled. He is fascinated, and disturbed, by the labrets, wooden discs worn in the opened up lower lip, which he sees worn in a number of locations; and like George Dixon a few years earlier he makes some effort to acquire a specimen. Otherwise his narrative makes few detailed observations on the people or their culture, the flora or fauna other than a resource; he is more comfortable in the company of Europeans, particularly some of his Spanish acquaintances. He is keen to record the political activities of the Sandwich Isles (Hawaii), where he made strenuous efforts to establish a British Protectorate. He is obviously more interested in the complex culture and social structures of this culture and that of Otaheite (Tahiti), to the point of observing local taboos and not apparently bearing a grudge over the death of his hero and mentor, Captain Cook; perhaps he was at first disappointed by what he found on the coast of America, though he writes more about the local people and their customs witnessed in 1793, and considerably more in 1794, going into some detail on subjects just as the expedition was nearing its end. Myths grow up to fill vacuums caused by the loss of the fabric of the actual, and sometimes supplanting it where it exists. Altercations with an aristocratic midshipman led to press attacks on Vancouver which severely damaged his reputation just before his death, and he was quickly supplanted in the nation’s list of naval celebrities by the captains and admirals of the Napoleonic wars. Despite a lingering reputation for aloofness and severity, he carried out a four year voyage around the world with a crew of over 150 with the loss of five men, remarkably few for the period; in the two places during charting trips where seamen were lost, places were named after them. On arrival in London at the end of the voyage his major concern was for the welfare of the ship’s crews. The last vestiges of the Vancouver house were removed in the 1960s, though the house had been gradually disappearing over many decades. The site and parts of the fabric of the building had been occupied by a Quaker Meeting House, and later a Labour Exchange; it is now in the delivery yard for the Vancouver Shopping Centre, though few people are aware of its exact location. HMS Discovery was broken up in 1834 at Deptford, less than a mile from where she had been built, after serving as a prison hulk; the Chatham was sold out of the Navy in 1830. Friendly Cove, where Cook and Vancouver first encountered American coastal Indians, has reverted to its former name, Yuquot, meaning "where the wind blows from all directions". 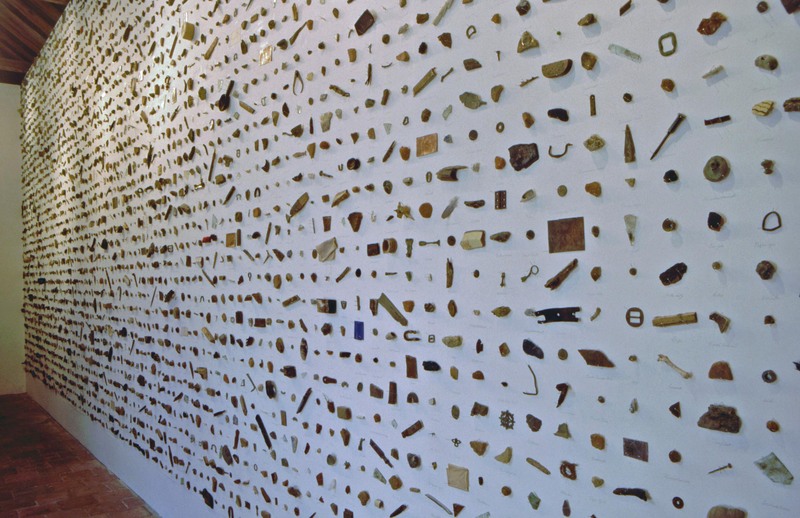 The work comprised a grid installation of around 4,300 objects reflecting the lost house, the voyage and the objects exchanged along the northwest coast of America. They were labelled with the names bestowed by Vancouver and the words of the indigenous languages collected by Europeans between 1778 and 1796.